Four years after the start of the Syrian revolution, much of the dominant analysis and commentary on the revolution and the subsequent war remains dominated by simplistic, dualistic world views and equally simplistic and dualistic policies and proposals. This article is an attempt to analyse the Syrian revolution as a multi-party conflict of interests and values, and the war in Syria as a multi-way war. You may have come across one of those social media posts, sometimes accompanied by illustrations, mocking the apparently confusing conflicts and alliances in the Syria war: the Free Syrian Army is fighting the regime and Daesh at the same time; the Free Army is funded and armed by Saudi Arabia, Qatar and Turkey; but Daesh is also supported by Turkey and funded by Saudis and Qataris. The regime is propped up by Iran and the Free Army by the US; but the US and Iran are partners in the war against Daesh… and so on and so forth. While often not very accurate, such posts do illustrate the complex Syrian reality that traditional, binary models of armed conflicts fail to grasp. 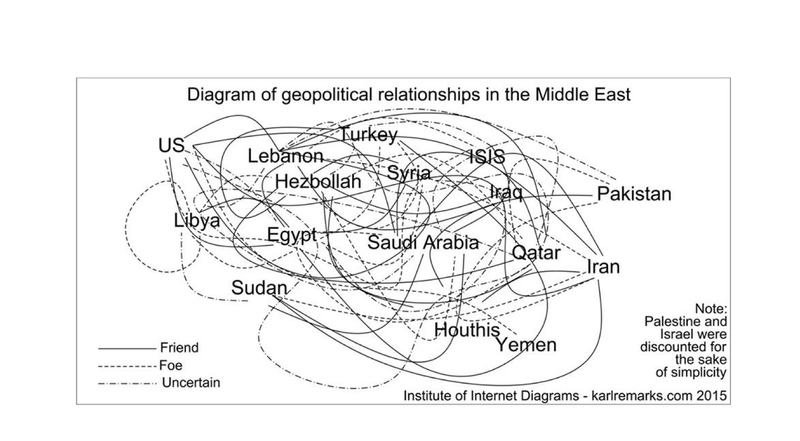 The same more or less applies to countless maps of areas of influence or of ‘who is fighting who in Syria?’ But is this complexity a new development, a result of the conflict dragging on and new actors entering onto the stage, or was it there from the very beginning but was largely overlooked due to our dualistic world views? In other words, it was easy for many Syrians in the beginning of the revolution to agree on what they stood against, but their fundamental disagreements on they stood for were largely ignored. And I am not talking here about tactical, changing conflicts and alliances but about radically different forces in terms of values, interests and aspirations. One reason for this ‘oversight’ appears to stem from the assumption that ‘the Syrian people’, faced with a brutal, totalitarian regime, are one and want the same thing – a slogan that was euphorically repeated in the first days of the revolution in an attempt to overcome the regime’s propaganda machine’s efforts to divide protesters along ethnic and sectarian lines. However, the nationalist illusions of imagined communities, to use Benedict Anderson’s famous phrase, also played a role in this oversight. There is also another, political reason. Driven by the belief that it could not afford another, simultaneous war with extremist Islamist forces, the moderate Syrian opposition endeavoured to unite all Syrian armed factions into one, unified front against the regime, even when these factions were radically different. The National Coalition’s pragmatic and elusive attitude towards Daesh and Jabhat al-Nusra until recently is but one example. The question is: did the ‘necessity’ to form a broad alliance, representing or uniting a broad range of different social and political actors, justify overlooking what was supposed to be the ultimate aims of the revolution? Did the moderate Syrian opposition really believe that radical Islamist groups were joining the fight to achieve the same freedom and social justice for which the early protesters took to the street? It can be argued that, by doing so, i.e. by defining and positioning themselves from the beginning only against the regime and not against other reactionary forces too, the moderate Syrian opposition groups claiming to represent the revolution fell into the trap of dualism: their discourse and practices did not reflect the complex political reality of Syria. Much of the commentary and analysis on Syria followed the same pattern. As for the Syrian regime, painting all the revolutionaries and rebels as terrorists and foreign agents was a too-obvious attempt to justify its repression and militarised response. But it also reflected a fundamental problem with this type of regimes, that is, its inability to see the country in a non-binary way. In this world view, there is only the regime, being the sole, self-styled representative of the interests of the country, and everyone else, who are therefore seen as the enemy as soon as they attempt to dissent. In short, the complex, conflictual reality of the forces taking part in the Syrian revolution and the subsequent armed rebellion and war was largely silenced because it did not fit our dualistic world views or immediate interests. But four years into the conflict, and even after alliances and actors have significantly changed, is there a good reason why most of the dominant analysis and policies on Syria remain so dualistic, often focusing only on one of the binary conflicts within this multi-party conflict? The simple answer is no. With the militarisation of the revolution in late 2011 and early 2012 – first by the regime forces and militias and the protesters’ resorting to arms to defend themselves, then by the interference or regional and international powers in support of this militant faction or that – the above-mentioned socio-political conflicts gradually developed into full-fledged wars. Most military operations by opposition and Islamist armed groups were initially directed against the regime. As military advances were made and power bases consolidated, however, ‘infighting’ over territory, weapons, spoils and influence started to surface, sometimes distracting from what was supposed to be the main battle. By the end of 2013, there were at least four main poles or parties to the war, with various other smaller centres of (armed) power revolving around them because they shared similar world views and/or similar goals and backers with the main poles – though they should not be readily lumped into one basket. 1. The regime and its various armed forces and militias, which were determined to cling to power and impose their rule at any cost, so much so that they had to resort to external forces (Iranian-controlled militias) to the extent of surrendering most of their political and military powers to the latter, leading to a de facto occupation by the Iranian regime and its militias of regime-held areas of Syria. 2. The moderate opposition, both armed and political, represented mainly by the Free Syrian Army and the National Coalition. The former was initially largely made up of defecting soldiers and locals picking up arms to defend themselves against increasingly brutal attacks by regime forces and militias. As the war escalated and the military and financial support provided, or promised, by regional and international powers diminished – because it was channelled more and more towards Islamist groups – many of the FSA’s members either joined these groups or simply gave up and fled. 3. Islamist groups, most notably Zahran Alloush’s Islam Army, which would later become the Islamic Front, and Ahrar al-Sham. Many of these groups’ members and leaders had been released from prison by the regime at the start of the revolution in an attempt to derail it towards a civil war and paint the revolution as a foreign plot involving ‘Islamist terrorists’. These groups also enjoyed better military and financial support by regional powers, especially Saudi Arabia and Qatar, presumably because they were seen as less dangerous allies, or clients, in the long term than democratic revolutionary forces. In this sense, this support, which came at the expense of that provided to the moderate Syrian opposition, also had the effect of derailing the revolution. 4. Extremist Islamist groups affiliated with or originating from al-Qaeda, most notably Daesh (ISIS) and the Nusra Front. While the two groups share similar roots and a similar ideology, and their internal conflict is mainly about power, an important distinction between the two has to be made in terms of their demographic composition: Daesh depends largely on foreign jihadists, while most of al-Nusra fighters and leaders are Syrians. Nonetheless, both groups are fighting in Syria to impose a specific version of Islamic rule and have nothing to do with the revolution. The revolution and the subsequent war were merely the context or the opportunity that allowed them to emerge and rise. As to the Kurdish armed forces affiliated with the Kurdistan Workers’ Party (PKK) and its Syrian offshoot, the PYD, which are often described as the ‘third way’, they do not really represent a third way. If anything, they seem to follow their own separate way, parts of which intersect with the events in Syria, while others follow their own specific Kurdish dynamics. As far as the Syrian revolution is concerned, these forces are still oscillating between the regime and the opposition, flirting or conflicting with this side or that depending on the situation on the ground. They are yet to settle on a clear, consistent position, or be forced to do so by changing geopolitical equations (the battle in Kobanê, the US-led war on Daesh and so on). The same can more or less be said about the National Coordination Body, or what is often described as the ‘internal opposition’, which has been following a similar pragmatic and elusive policy and discourse based on redundant and selective arguments about foreign intervention. Groups falling under the categories 3 and 4 above grew bigger and stronger in such a short time due to a combination of factors, as indicated above, including the facilitation of their activities by the Syrian and Iranian regimes and the complacency and support of other regional and international powers. Another important factor, however, has been the moderate opposition overlooking their threat and not acknowledging it until very recently, mainly due to the opposition’s inability to see or act beyond its binary conflict with the regime. Indeed, the FSA, or what remains of it, was forced to fight Daesh and al-Nusra in 2014 and 2015 because they were attacked by them. They did not choose to do so as a matter of principle. In any case, it can be said that all these groups and factions are today at war with one another, despite temporary and changing truces and alliances every now and then. It is true that Daesh and the regime did not really fight one another until they were forced to do so recently by changing global agendas, and that groups like the Islamic Front are more obsessed with territorial gains than principled struggles, but the potential of what appears to be fundamental socio-political conflicts turning into full-fledged wars has always been there. Yet, despite all these developments, a dualistic view continued to dominate much of the debate and writing on the war in Syria, often painting what is happening in the country as one war between the regime and the opposition forces, or between government forces and Islamist terrorists, or between Iran and Saudi Arabia, and so on and so forth. This dualism may partly explain the US administration’s prioritisation of the war on Daesh and ignoring, or postponing, an inevitable confrontation with the Syrian regime and its backers – as if a state can only have one ‘enemy’ at a time. It also may partly explain why many Syrians were quick to believe near-conspiratorial theories about Daesh & co. being ‘created’ and being under the ‘total control’ of the Assad regime – which is different from acknowledging the reality that the latter did facilitate, collaborate and utilise these groups for its own advantage – because they do not appear to be able to imagine more complex relations between different actors in a multi-party conflict. In this regard, the Syrian opposition’s calls lately for international support to fight a two-front war (fighting Daesh and the regime at the same time) often come across as opportunistic; as unsuccessful attempts to drag the US and its allies to fight the Assad regime and its backers, which they have so far been unwilling to do. Such calls do not appear to stem from a genuine belief that the revolution has more than one enemy, and the opposition does not yet appear to be serious about confronting radical Islamists, not just Daesh, and political Islam more generally, in both its Sunni and Shia manifestations. Another way in which dualism has been dominant in the analysis and commentary on Syria is the widespread portrayal of what is happening in the country as a sectarian civil war between Sunnis and Shia, lumping together very different actors, both culturally and politically, into this sect or that. The most obvious example is lumping the Alawis and the Shia into one sect, and all other Syrians into the elastic category of ‘Sunnis’. This is not to deny that there is sectarianism and sectarian practices in Syria on all sides, but sectarianism is not the only thing that there is in this complex country, and sectarianism in Syria is certainly more complicated than a static Sunni-Shia conflict. Even the term ‘counter-revolution’, which is being used a lot lately in an attempt to explain how events in Syria have played out, is in a way an expression of this dualistic world view. Counter-revolution means reversing a revolutionary process or restoring the status quo. What is happening in Syria does not really fit this model. It is more accurate, in my opinion, to talk about multiple revolutions and counter-revolutions unleashed in Syria – and the whole region more broadly – some of which are of progressive nature or potential and others reactionary. And I use the word ‘revolution’ here in a broad sense, to mean fundamental changes in power structures and values that take place violently in a relatively short period of time. Revolutions are not necessarily progressive, neither are all counter-revolutions necessarily reactionary. There are many examples of three- and multi-way wars in history: the Chinese civil war, the Lebanese civil war, the Yugoslavia wars, and even World War II to some extent. It may be true that most of these conflicts were talked about at the time in dualistic ways, focusing on one binary conflict at a time within a more complex war. But at least today, we understand these wars to have been multi-way ones. Is it the same with the Syrian revolution and war? Do we have to wait years before history writers revise their simplistic views of armed conflicts? Yet the problem is not just discursive or academic. A sustainable solution to the crisis in Syria requires an analysis that goes beyond these simplistic, dualistic approaches. It requires, for example, the moderate Syrian opposition to clearly state its position vis-a-vis Islamist forces, not just Daesh and the regime. This will at least provide a better guidance for forming alliances that differentiate between the strategic and the tactical, without betraying the original goals and aspirations of the popular revolution. On a state policy level, a more nuanced approach to armed conflicts may succeed in persuading the US and its allies to seriously support the moderate Syrian opposition in its multiple wars, rather than insisting that such support should be solely directed, for now, at fighting Daesh, which is what the US administration has been doing. And to be effective, such support should be provided through one unified channel, rather than leaving it to regional powers with conflicting agendas. On a popular level, there is today more need than ever for critical solidarity with the Syrian revolution; a solidarity that does not fall into false binary polarisations and is not, at the same time, ‘conditional solidarity’. Critical solidarity means you support a struggle as a matter of principle, with real, material support, but maintain an active, critical stance toward a particular version or force that claims to represent people’s aspirations or capitalises on them for political ends. Without such solidarity, it is likely that we will keep being presented with the false choices of Assad vs. Daesh, or Iran vs. Saudi Arabia and so on. * Shiar Youssef is a Syrian journalist and researcher. Posted on May 5, 2015, in Uncategorized. Bookmark the permalink. 3 Comments. excellent post. it should be noted, however, that contrary to leftist assumptions, the Saudis have actually been very suspicious of Islamists, recognising them as a threat to their own throne. They have sometimes armed more ‘moderate’ Islamists with connections to the kingdom, but they have armed ‘secular’ groups much more, particularly in the south. Of course they hasve never armed or funded Daesh, which is a direct threat to them. While there is some useful analysis in the above article, in particular its illustration of the multi-faceted nature of the struggle going on in Syria, it is fatally compromised by its pro-US perspective, as demonstrated by the penultimate paragraph. The article should have been published with a preface distancing the site from the pro-US perspective of the author and giving an indication both of how the author’s perspective would lead the Syrian Revolution into yet another blind alley and of what a better course of action would be.